There’s no question that we have moved into a new working world. We’re no longer sitting tethered to phones and desks to get work done or having to commute to a dedicated brick and mortar location. Today’s business worker is empowered by so many technologies it’s impossible to not think of it as an exciting time to be employed. But there are issues, even with all of these innovations that are slowing down productivity, and that should be addressed. Think about the worker who has logged in remotely to work from home and is answering emails and working productively when a connection is lost. Everything looks good on their end, but nothing is happening on their screen. As many can probably already relate - that alone can be a nightmare to remedy. Or how about the office that’s now offering an “open plan” environment for its workers. It’s supposed to foster collaboration and save space and money – but then you’re sitting there, in the open, with everyone else, and you can’t hear the person on the phone or your conference call quality is degrading. What do you do? An upcoming webinar sponsored by Sennheiser and aptly titled, “Reclaim Your Office,” will address this very topic. On Wed., Nov. 16 at 12 p.m., Brian Brorsbøl, Director of Product Management CC&O, will go over the benefits of open-plan offices, the challenges and how Sennheiser’s offering answers the call. 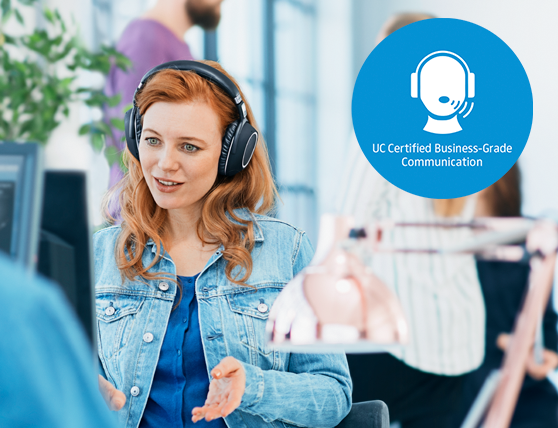 The Sennheiser MB 660 adaptive ANC wireless headset is UC certified for knowledge workers that are working in demanding business environments and need premium sound quality in their open office environments. It constantly monitors background noise and adjusts as needed. To learn more, REGISTER NOW!